Have you ever tried to make a wreath out of fresh greenery at Christmas time? Maybe you had some extra branches you trimmed off your tree, or maybe you picked up some of those bunches of greenery you can get at the grocery store this time of year. You can either just bunch the branches around themselves and keep tying them onto themselves until it’s somewhat circle-like. Or you can get some kind of wreath form and try to cover it with branches so that none of the actual wreath form sticks out. Let me tell you, neither of these options are easy, and thus, clearly not for me. But look what is for me! This shining example of wreathyness took me all of, maybe, a minute and a half. Instead of using a wreath form that needs to be hidden, I just used this old grapevine wreath that I reuse over and over again for everything. It adds to the whole woodsy natural look, rather than taking away from it. I just tucked in some bits of cedar and pine from around the yard. No tying, gluing or pinning needed. The little red ribbons are purely for cuteness. I’m so glad I clued into this little trick! So if you’re feeling crafty this year and think you want to make yourself a wreath out of fresh greenery, save yourself the headache and the 45-minutes of trying to turn your pine oval into a wreath, and take the easy (and pretty) way out! Nice wreath! Love that it’s so easy and you can reuse that grapevine wreath later! My kind of project! Totally easy-peasy wreath Court! Love it! I love using natural cedar and pine for the Christmas holidays! great idea for simple and easy me to make. i think i could handle that one. i am not crafty. when i make a craft and it turns out i am shocked!!! What inspiration you gave me…thank you I have to try it for my front door! I love the cute, little, red ribbons too! Love the wreath…simple and elegant and looks great on your red door…love the snow spray too! I have a grapevine wreath that I decorate over and over as well…right now its covered in a striped scarf! The time to celebrate Christmas festival is near and best decoration is require for it, you should make nice and different green branch round in front of your home…that are defiantly nice thing. I can totally do this! Can’t wait to get some cuts from our yard at Hansel and Gretel!! Your wreath looks great and I love your door, did you paint it and if you did what colour is it?? Thanks! 3 cheers for the grapevine wreath! I have one myself and am going to do something with it for Hanukkah… love your xmas idea! Very cute, great idea! I have a grapevine wreath that may need some attention. Love your red door! 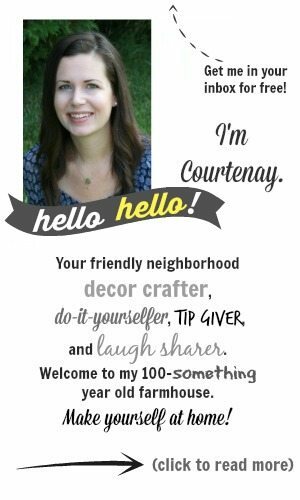 Thanks so much for linking up Courtenay! 😉 Love your wreath! What a great idea! So much easier than messing with all that greenery! Thanks for sharing. great idea, and so easy! love that little ribbon! What a great idea! I could probably do this. Thanks for sharing. Nope….it’s not as simple as it looks. I know….I made five of them…. 🙂 Yours is much easier and I am sure going to file this idea away for next year. Very pretty! Love this easy idea for making a natural wreath. I have read so many posts about the blogger lovers however this article is really a good post, keep it up.